Patients with sarcoidosis with cardiac manifestation have a worse prognosis due to sudden cardiac death. The most important predictor of survival appears to be left ventricular function.1 A 25-year-old female patient was transferred to our hospital. Initial echocardiography demonstrated a reduced ejection fraction (EF) of 30%. Based on CT scan, a diagnosis of cardiac sarcoidosis was suspected. This was proven by transbronchial biopsy. As a novel method, macrophage-directed positron emission tomography (PET)/CT using the somatostatin receptor ligand 68Ga-DOTA-TOC was used to image active inflammation in the thorax. Potential advantages of 68Ga-DOTA-TOC over 18F-FDG are a lower radiation exposure and a simplified and less artefact-prone imaging procedure as elaborate patient preparation protocols suppressing physiologic myocardial glucose uptake are not needed with 68Ga-DOTA-TOC. Areas of abnormally increased tracer uptake consistent with inflammatory changes were observed both in the lung (figure 1A) and in the left ventricle (figure 1C). Corticoid treatment and heart failure medication were initiated leading to a rapid clinical improvement, accompanied by an increase in EF (45%) and reduction in inflammation as seen in the follow-up by 68Ga-DOTA-TOC 4 months later (figure 1B,D). In anticipation of an improvement of EF, the patient was equipped with the wearable cardioverter defibrillator (WCD, LifeVest system, Zoll) to protect against sudden cardiac death. This allowed insertion of an implantable cardioverter defibrillator (ICD) to be deferred. One day after discharge, the patient presented with symptomatic sustained ventricular tachycardia, that was detected and terminated by one shock (figure 1E). Despite improvement of EF and no further ventricular arrhythmias after 8 weeks as shown by the LifeVest Network, the patient finally decided on a permanent ICD placement (figure 1F). The Heart Rhythm Society (HRS) consensus statement states that an ICD implantation ‘is recommended’ in case of spontaneous sustained ventricular arrhythmias, prior cardiac arrest, or EF ≤35% despite optimal medical therapy and a period of immunosuppression (class I recommendation).1 The document states that an ICD ‘can be useful’ (class II recommendation) where: permanent pacemaker implantation is indicated, there is unexplained syncope, or inducible sustained ventricular arrhythmias (IIa), or an EF between 36% and 49% despite optimal medical therapy for heart failure and a period of immunosuppression (IIb). This case illustrates for the first time that the WCD provides an efficient device in a patient with cardiac sarcoidosis. 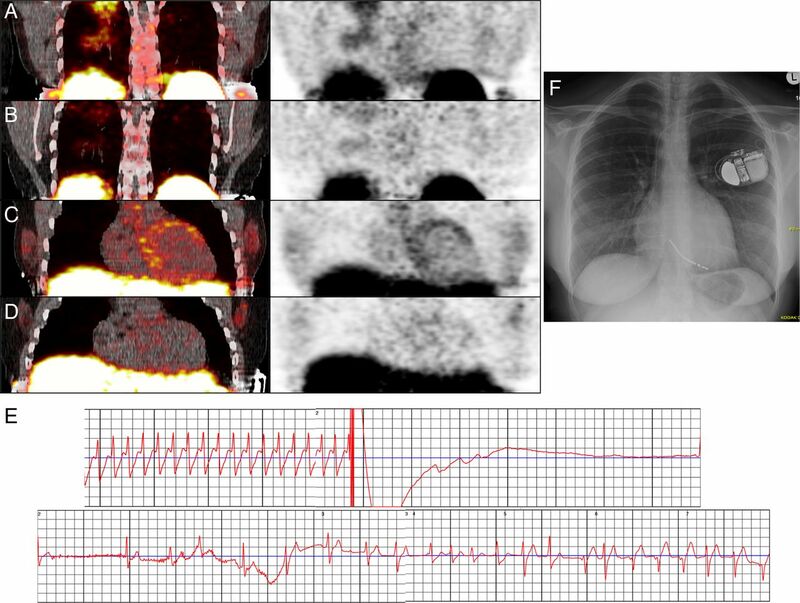 Positron emission tomography (PET)/CT using somatostatin receptor ligand (68Ga-DOTA-TOC) shows areas of abnormally increased tracer uptake consistent with inflammatory changes both in the lung (A) and in the left ventricle (C). Reduction in inflammation in the follow-up PET/CT 4 months later after corticoid treatment (B and D). Sustained ventricular tachycardia documented and terminated by shock from the wearable cardioverter defibrillator (E). Chest X-ray after implantation of a single chamber implantable cardioverter defibrillator (F).